This is an unofficial Southwestern Pennsylvania Railroad railfan page. This page has no affiliation with Southwestern Pennsylvania Railroad. To my knowledge, the Southwestern Pennsylvania Railroad does not have an official web-site. 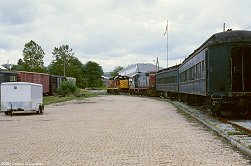 The Southwest Pennsylvania Railroad (SWP) operates over former Pennsylvania RailRoad and Baltimore and Ohio railroad branches. 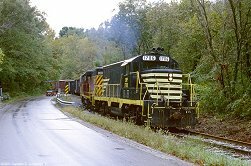 The mainline of SWP starts at Radebaugh west of Greensburg PA, where the SWP interchanges with the Norfolk Southern Railroad,. From Radebaugh the line runs south to Scottdale, the operations center of the SWP. Branches connect to southwest Greensburg and to Yukon. From Scottdale a branch runs to New Stanton, servicing the Sony facility and a new intermodal terminal under construction. From Scottdale also runs a branch to the Bullskin coal loader near Connellsville. From Scottdale the mainline continues south through Owensdale, where a new connection to the Wheeling and Lake Erie Railway has been installed in late 2001. The connecion is installed in conjunction with the intermodal terminal under construction at New Stanton, due to open in 2003. The Owensdale connection already sees occational interchange traffic. 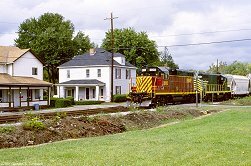 South of Owensdale, at Broadford, the SWP connects to the CSX Railroad and runs into Connellsville under CSX trackage rights. At Connellsville the SWP interchanges with the CSX. SWP trackage rights extend a few miles beyond Connellsville where the SWP heads south to Uniontown and beyond. I don't have very much experience with railfanning the SWP so contributions from others regarding operating schedules are very welcome. 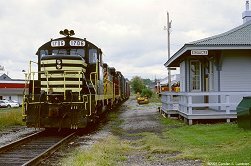 I missed a great photo at Broadford - the train was faster out there from Connellsville than I thought, and I only saw the picture in the rear view mirror! But the railroad follows the road north of Broadford, so here's the train... September 25th, 2001. After setting off a few cars in the yard in Everson the train heads up the Mt. Pleasant branch. Scottdale September 25th, 2001. Back in Everson for some more switching. September 25th 2001. The SWP lives here, in "Downtown" Scottdale. September 25th, 2001. The train ties down at the Scottdale Depot, waiting for a 9 PM crew to take it north to Greensburg. No good for photography so that part of the line must wait 'till another visit. Scottdale, September 25th, 2001. 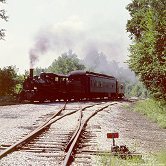 Not really the SWP but the Laurel Highlands RailRoad used to run steam excursions from Scottdale to Mt. Pleasant. Here number 7 is waiting for departure time at the Scottdale depot. Summer 1999. 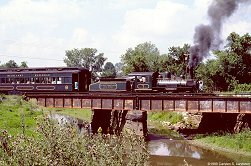 Number 7 backs the train down to the junction with the Mt Pleasant line, crossing Jacobs Creek in Scottdale. Summer 1999. Backing through the junction. The Mt. Pleasant line is in the foreground. 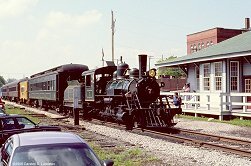 Scottdale, summer 1999. Finally on its way to Mt. Pleasant. Scottdale, summer 1999.